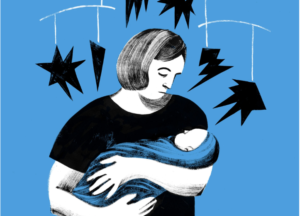 The clinical definition of postpartum depression is a ‘medical complication of childbirth,’ but this doesn’t take into account women’s emotional lives, and the fact that the way our culture treats some new mothers amounts to abuse. Pregnant women are often pickled in horror stories about birth, then subjected to unnecessarily intrusive care. Many suffer pelvic trauma; one in three wind up with major abdominal surgery. Then they are sent home with a newborn, typically without support. According to 2015 data, a quarter of women return to work in two weeks. Everyone says that ‘breast is best,’ but new mothers get a decent place to pump at work only if they’re lucky. Most won’t see their doctor again for six weeks. No wonder depression is so common.